Adobe today announced the launch of Project Rush, a new video editor that takes the core features of its pro tools like Premiere Pro, After Effects and Audition and combines them into a single, more accessible tool. Don’t get too excited yet, though, the new tool will only be available later this year (and my guess would be a launch at the company’s Max conference in October). The target audience for Rush is the average YouTube creator who is looking to get professional-looking results — and do so fast because the expectation on the platform is for regularly pushing out new content. 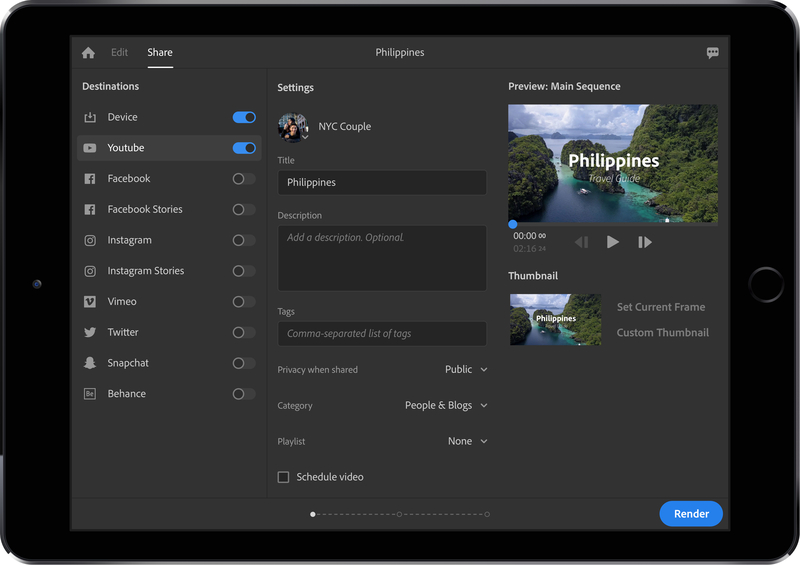 Rush wants to become the all-in-one video editing app for creating and sharing online content and to do so, the team decided that it had to ensure that Rush was available on any device, no matter whether it’s a high-powered desktop or an iPhone. All projects are automatically synced to the cloud, so you can work from anywhere. In building Rush, Adobe decided to leverage the technology it had already developed for its professional tools. That means when you tweak a video clip’s color, for example, you are using the same underlying algorithms as a video editor who works in Premiere, for example. Rush will also support Motion Graphics templates for building title sequences and graphs in videos and it’ll use the company’s AI tools for improving the audio of video clips. There is also an integration with Adobe Stock, in case you need a bit of stock footage to spice up your video. Based on the demo I saw, this all looks pretty intuitive and quite a bit more like iMovie than Premiere. Once you’ve created your video, the next step is obviously publishing it and in the spirit of helping creatives work faster, Rush features built-in publishing support for all fo the major sharing platform, be that YouTube, Facebook, Instagram, Twitter or Snapchat.